Election Day is coming! Election Day is coming! I went to a party the other night to celebrate the work of the newly-founded Women’s Equality Party here in New York. On the host committee were several lovely feminist friends and interesting Democratic Party folk; anything called “Women’s Equality” is sure to at least get me interested to show up for crudite, mingling and wine. The event had the usual pre-election lineup of speakers, and it was definitely refreshing to see so much emphasis placed on women and “women’s”* issues– pay gap, sexual harassment, domestic violence issues, strengthening Roe v Wade. I don’t normally swim in a lot of electoral circles, because frankly, I don’t have the patience it takes, especially in a city and state like the New Yorks, to work with the legislative process. But I’ll heartily support my co-conspirators who do, and this, on the surface, seems like a pretty good deal. Then I saw that Christine Quinn was one of the featured speakers. Now, I was all about having a woman as the mayor of NYC, and our first out lesbian, too. But I really didn’t dig on her politics–for one, she blocked the Paid Sick Leave law for years as speaker of the Council, which was widely seen as either needed or desired for her support from Bloomberg as his successor. She’s also a Democratic Party machine insider, which also isn’t automatically bad, but given the sorry state of electoral politics here, isn’t really… good, either. 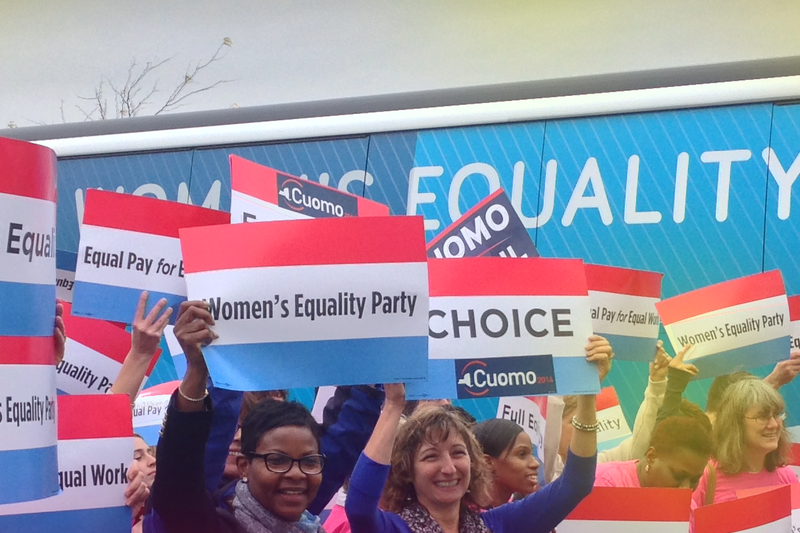 So I did a quick Google search on WEP while listening, and found two themes very quickly: the WEP is a Cuomo-backed operation, and there is a lot of speculation that Cuomo’s machine has launched WEP to specifically siphon votes away from the Working Families Party. Oh my. Disclaimer, in case it’s necessary: I love the Working Families Party. I love the idea behind what they do, and many of their people, including its founder, are friends. My longest-time client, Jim Hightower, is also a big supporter of WFP and a critic of Cuomo’s end (read: the Clinton end) of the Democratic Party. You might be getting a picture of where my electoral politics go here, right? Working Families has always been on the side of “women’s” issues, especially when it came to the Paid Sick Leave fight. They’ve been fighting the good fight without the label of “women’s” for years now; and, as one of their co-chairs said, do we really need to put women into a separate category when it comes to voting? It’s starting to feel like the Voting Ladies Auxiliary Circle. That’s a struggle we run into a lot as feminists: when do we highlight the different needs that people that identify on the female/feminine end of the spectrum have? When do we make this about humanity, and not just “women?” I do believe there’s a time and a place. I’m just not sure that it’s at the voting booth. But, as an insider in all this said to me last night, “Even the fact that parties are competing to show how much they stand for women is a good thing, IMHO.” True, that. Nevertheless, the Working Families Party still has my support on November 4. * I’m so sick of things like comprehensive health care, family needs, etc, being siloed into the corner of women’s issues that I refuse to not use quotes around them.